Trusted and nationally-renowned service that can build a verandah with professionalism, quality workmanship and long-lasting materials. In the market for a trusted and nationally-renowned service that can build a verandah with professionalism, quality workmanship and long-lasting materials? 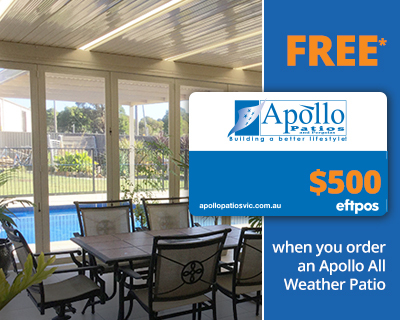 Apollo Patios are the verandah builders Melbourne and the wider Victoria region can rely on. With local teams offering local verandah designs throughout Victoria’s rural & suburban areas and townships, our service makes sure to involve you in the design process. We offer a FREE Home Lifestyle Evaluation at your home, where we use our 27 Point Lifestyle Checklist to find out exactly what you need and want out of one of our verandah designs. Melbourne and wider Victoria home-owners know they can rely on Apollo Patios for verandahs that are truly tailored to their lifestyle.